Home AVFC Supporters Brigada 1874 The Outlawed ‘One Stan Petrov’ Banner Surfs When it Wants! The Outlawed ‘One Stan Petrov’ Banner Surfs When it Wants! The use of the ‘One Stan Petrov’ banner during the minute applause for Villa’s captain Stiliyan Petrov is still banned by club officials. In fact, MOMS has even received a call from a representative of the club saying they disapproved of our support of Villa supporters surfing the banner. 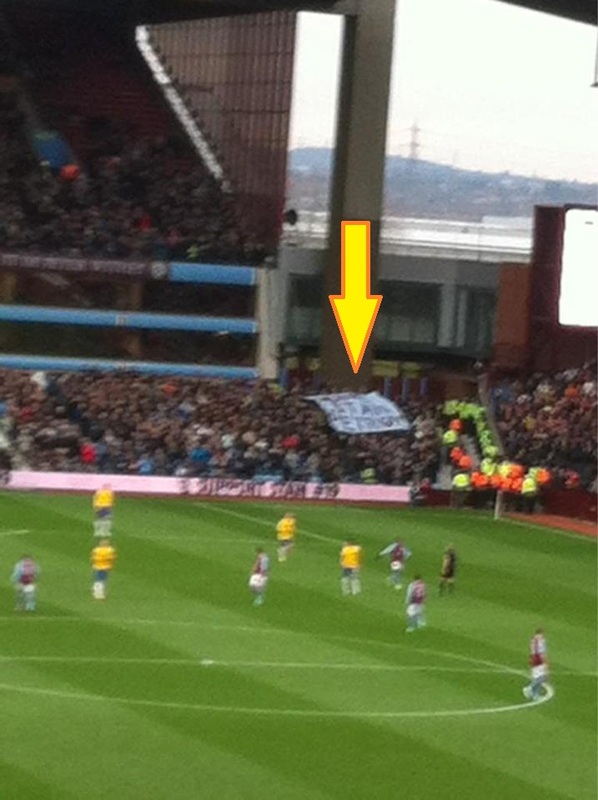 The ‘One Stan Petrov’ banner had been making appearances in the Holte End despite increasing steward surveillance, until recently there was an attempt at confiscating it from L8 of the Holte. News of this brought an offer to help the Brigada 1874 group who own the banner. 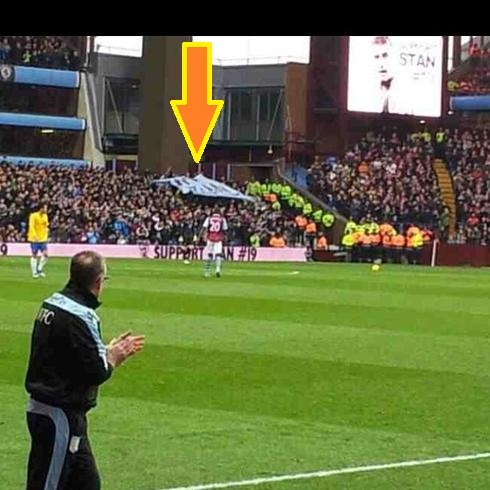 At the recent Southampton game, fellow Villans in the Lower North Stand took over the honour of surfing ‘One Stan Petrov’ at the other end of Villa Park. You can’t keep a good banner down! The minute surfing was observed immaculately and the banner also received fantastic coverage on the live TV coverage of the Saints match around the world; with three close-ups of the banner seen during the Petrov minute (they even showed the banner being swiftly rolled up after the applause). Why did the TV coverage zoom in on the supporter’s ‘One Stan Petrov’ banner during the one minute’s applause, when they could have just made do with the club’s giant screen display? Because it is a symbolic gesture from the supporters to their captain. A show of solidarity from the heart of football supporter culture that representatives at the club clearly don’t seem to grasp. There shouldn’t be a problem with it, because there isn’t one. The ‘One Stan Petrov’ banner isn’t an anti-social exercise and should not be vilified as such. Representatives at the club for the sake of pandering to nine of their customers (some of whom have since admitted that the banner wasn’t a problem per se), have created the issue. The marketing department were originally happy to use the image of the banner on the club’s website last season. For the record, over a thousand supporters have signed the MOMS petition to allow the banner to be used at the 19 minute mark. Most Villa fans will applaud the club’s decision to issue free flags for Villa’s semi-final second leg at Villa Park against Bradford City. It’s a great way of adding to the atmosphere of the match…but aren’t the club’s officials suffering double-standards here? When you consider the reason for not allowing the use of the ‘One Stan Petrov’ banner is because fans might have their view blocked (for a matter of seconds within the minute’s tribute). But 40,000 waving flags during the whole game, won’t partially block any supporter’s views? Also, football clubs are happy to sell football supporters restricted view seats. Should that practice be banned as well? Flags, banners are all part of supporting your club and as long as due consideration for fellow supporters is taken, there shouldn’t be an issue. STAN is ONE!!! Forever! Liverpool , you are best club number 1 in the world. Thanks for support. I’m bulgarian and thank you for support for STAN!! The Petrov banner is an act of support for our skipper, nothing more, sadly the club are making an issue out of something that isn’t there. Bruisedshins Yeah, that’s the thing, it’s really no big deal. Nobody battered an eyelid last season when it was surfed. It’s just that certain people were a bit shocked when the Brigada 1874 group turned up on their turf in L8 at the start of the season. A few words were exchanged, and the nine people who complained used the banner as an excuse. Obviously, there was going to be an ‘adjustment period’ of a couple of games in L8, while everybody got used to each other…but the fans that complained maybe jumped the gun a little. I think if they now said to the club, they don’t really have a problem with the actual banner, the club officials wouldn’t worry about it. MyOldManSaid Bruisedshins I’m not so sure that the club would warm that easily to the idea, I think for them it runs deeper, maybe it’s an issue of control, perhaps they don’t like displays happening in the ground that are out of their control? Bruisedshins MyOldManSaid It’s all about control for football clubs in terms of what happens in their stadiums. The Liverpool Supporters Union, known for their banners and displays on the Kop, told us they had to build up trust and communication with the Anfield stadium manager. I think the same goes with this particular issue. There should definitely be more of a culture of communication on matters such as this, but also more understanding by officials at the club to supporter culture.